The arrival of spring and warmer weather usually has us thinking about rejuvenation and renewal. We do “spring cleaning”, replace our winter wardrobes with our summer ones, spend time in our gardens and step up our exercise routines. Why not give our faces a little “lift” as well? Dr. Richard E. Buckley and Dr. Marina Buckley of MilfordMD Cosmetic Dermatology in Milford, PA, have some easy solutions on how to get a great new look for spring. 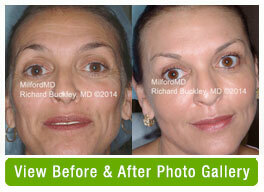 There are also a variety of fillers available that “plump up” the skin to lessen the appearance of wrinkles and lines. The results are immediate and last approximately 6 months or longer. BOTOX® Cosmetic and Collagen treatments are also a great way to reduce wrinkles and provide a fresh look for several months without having to take days off from work or refrain from wearing makeup for a period of time. In addition, laser treatments are widely used for reducing the effects of aging and repairing damaged skin. These also stimulate collagen growth in the skin to give it a smoother look and a younger, healthier appearance. All of the above treatments are fantastic alternatives to a surgical facelift and can help you achieve your new spring look without downtime or a long recovery period. For more information, Call MilfordMD today for your Liposuction Body Sculpting consultation with Richard Buckley, MD at: 1-800-664-1528 or 570-296-4000.